This Glossary is a work in progress, we will be adding more as and when we get asked, "What?" Our range of services for cleaning up accidents. Although it is very bad form to define something by what-it-is-not, this service doesn't mean crash damage to bodywork, but it does cover just about everything else, from spillages of food, fuel and chemicals, to cement splatter and industrial fallout. Accident may include decontamination, odour removal and falls into two categories, savoury and unsavoury. Lease companies in particular proscribe that any car returned to them have no visible signs of repair. Anything that falls short of this description is likely to incur a recharge, and so an acceptable repair is usually one that the layman would never notice that a repair had been done. See Appropriate Repairs. A triangular shaped body panel which results as a convergence of other features. The most famous 'A' panel is on the Austin Mini. The phrase 'appropriate repair' is self explanatory, but it's relevance and importance will best be understood by people working around cars who will have often see inappropriate repairs carried out. There are often different methods of repair that could be applied to a particular kind of damage, it is important to choose the right one based on size and extent of the damage, position, colour and value of the car, terms and conditions of a lease/PCP contract, BVRLA Fair Wear & Tear Standard, etc. Example 1 ~ Smart Repair/Small Area Respray techniques are excellent for repairing scuffs on corners of bumpers and some other select places around the car, however they are NOT suitable for repairing a scratch in the middle of a bonnet - the results will simply not be good enough and the whole bonnet should be repainted at a bodyshop. Unfortunately there is a tendency, especially with mobile technicians to over-reach themselves, either because they have been called out and don't want a wasted journey, or because a driver is pressuring them into providing a cheaper form of repair. Example 2 ~ Likewise, a small scuff on a bumper will seldom require a replacement bumper even if the panel comes pre-painted. However, if you take a car to an outlet that is used to replacing/repainting panels, this will be the kind of repair they are likely to carry out, even if it might be overkill. In this case, although the repair will be 'acceptable', you might overpay by as much as a factor of twenty! One of our customers recently shopped around for somebody to repair his cracked bumper. Nobody be asked said they couldn't do it! He was quoted everything from £75 for a smart repair/Small Area Respray to £1500 at the dealership. We fixed it with a midi-repair for £360, which was both acceptable and appropriate. Example 3 ~ Lets suppose that a car has a one inch scratch on the driver's door; If that car happens to be a one year old Bentley, there is no doubt that the appropriate response will be to repaint that door and blend out over the panels either side. A car of this value warrants the expense of repainting these three panels. However, the cost of such a repair could be more than the value of your Granny's 15 year old Fiesta, in which case it would be more appropriate to touch in the scratch with a small brush (cosmetic repair). A projecting rim or lip on an alloy wheel where the tyre is seated. To "break the bead" means breaking the air-tight seal between the tyre and wheel. This is an expression from the insurance industry. It comes into play when a repair for minor damage significantly improves or 'betters' your vehicle as a side effect. For example, if you have an eight year old convertible car and the hood is slightly tatty, and through accident a hole is ripped in the hood. The only way to make good would be a replacement hood which might be at a cost which runs into thousands of pounds. This repair would significantly better your car -- meaning that your car is now worth more than before the damage occurred. In these cases the insurance company may ask you to contribute to the cost of the repair above and beyond your insurance excess. Often, after weighing up the cost to you versus the increase in value of the car, it may be well worth doing. Poo dropped by birds. Often highly corrosive depending on what the bird has been eating, they can etch your paintwork very quickly. A centre where repairs are carried out to car bodies. They may also undertake full body resprays and custom paint work. Strictly speaking any repair carried out at a body shop. However, we and the body shops we deal with try to differentiate and re-brand different kinds of repair carried out at a body shop. The reason for this is that when you mention the 'body shop', people's minds tend to jump immediately to pictures of major repairs for crash damage and insurance claims. However, many body shops choose to avoid insurance companies and 'wrecks', instead focusing on fixing more minor damage and carrying out 'projects', for example strip-down and rebuilding classic or prestige cars. Some may even specialise in custom paint jobs applying high metallics, candy coating. The more minor repairs are really quite hassle-free, cheaper and quicker than most people imagine, which is why we class them as Midi-Repairs. We now only class as body shop repairs anything which is likely to require panel replacement major, panel beating and/or large areas of paintwork. See also: Midi Repair, Panel Beating, Smart Repair. Article: Smart Repair, Body Shop Repair... and why we ask you to send us photos! The bolster is the name given to the seat panels at either edge of the seat, usually on the upright. In the 1980s it became common for car manufacturers put seats in cars which mimicked the style of racing bucket seats, which by their design wrap around the passenger's body holding it in place against lateral g-forces which are experienced during fast cornering. As anybody who has ever climbed in and out of a racing car will tell you, bucket seats don't do much for your dignity. Nor are they very adjustable, so they are not ideal for the average family saloon. The solution was to have raised bolsters, sometimes just on the upright, but often on the base also. Because they are raised they are prone to wear, this especially seems to be the case with leather upholstery. A box section is a structural element fabricated in such a way that sheet metal is folded or joined so that it is fully or partially enclosed when seen in cross section. 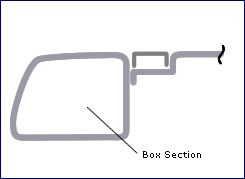 Box sections gain their strength from their shape and are very common element of the body shell/frame of a car. 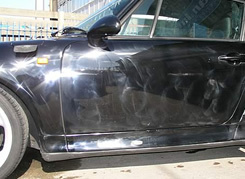 In Paintless Dent Removal it is usually necessary to access the back of the panel that a dent is on, if the dent is on a fully enclosed box section this can mean that this is impossible. An old fashioned name for Machine Polishing. Rapidly falling into disuse... mainly because it sounds a bit naff! Article: High speed buffing with large pads. Clear Coat is the layer of clear lacquer which is the top layer in Clear-over-base paintwork. Back in the old days, most cars were painted with primer-paint, only metallic colours had a coat of lacquer. But these days, with the exception of commercial vehicles, all manufacturers coat all colours with clear. Cross section drawings of both kinds of coating can be found here. See also: Clear-over-base, Flat base. As method for painting cars where three layers are used, primer, base colour, clear lacquer. This form of painting has replaced Solid-Base/Flat-Base over the last 20 years on all but some commercial vehicles. See also: Clear Coat, Flat base. A car care product that does two jobs, usually it will both wax and polish. A liquid or paste which contains an abrasive used for polishing. A surface, superficial repair or cover-up. 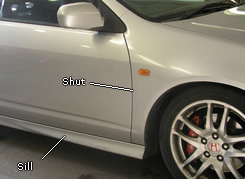 A dent puller is a method of pulling a dent out of a panel from the face. Although it is a method that works, it isn't as effective as traditional Paintless Dent Removal Methods because there isn't as much control. The basic technique involves gluing a plastic lug to the face of the dent and then pulling it, either with a slide hammer or a hinged lever. In our opinion, the very best company manufacturer of dent tools is Bristol Light Engineering. They can be bought direct, we recommend visiting their website to see the full range of dent tools. 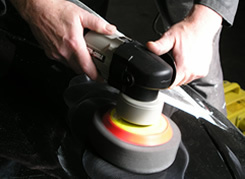 Dent tools are used for removing small dents from car body panels. Usually metal levers of 5-12mm diameter in different lengths. Any tool used in paintless dent removal it technically a dent tool, although we generally use it to mean specifically the leavers that are used to reach behind body panels. The red line follows the door 'L'. The area inside the bottom of the door, and the upright pillar opposite the door hinges. These areas do tend to get dirty and will get cleaned on a valet, while the area on the opposite pillar which has the door hinges is not cleaned as standard. firstly because it doesn't get very dirty, and secondly cleaning could remove lubricants and protective coatings which would then need replenishing. An area of bodywork which has a second panel behind the face panel. This is a structural feature much like a box section. 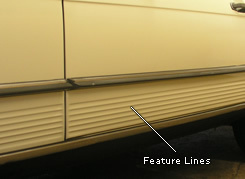 Double Skinned areas are fairly common around rear wheel arches, rear quarters and door areas. 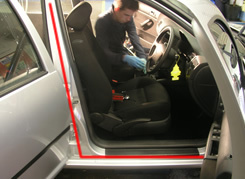 They can cause problems for Paintless Dent Removal if these areas are fully enclosed as the limit access. An Americanism for describing a car with a convertible roof. The viability of a job weighed against the alternatives and outcome from a financial perspective. Example 1. It isn't worth spending more on the car than the car is actually worth! Certain services can become very expensive, for instance, cars which have been damaged in floods. Before any work begins it is important to weigh up the extent of the damage on the car, the likely end value of the car (considering it will now have a history) and the availability and cost of parts (having a donor car can tip the scales). Example 2. It's seldom worth spending more on a repair than that repair will increase the cost of the car. We would all like our cars to be pristine and looking the way they did when they drove out of the showroom, however, the law of diminishing returns means that fixing every tiny error won't increase the value. It isn't worth having the bonnet resprayed because of one stone chip... usually. Example 3. It's not worth carrying out repairs when a replacement works out cheaper. We are sometimes asked about repairing alloy wheels that are very badly damaged... it can be very costly for an engineering firm to repair buckled or broken wheels which is viable if those wheels cost £1000 each from the dealership, but a different story if you can pick up a set on eBay for £150. Some people will want to spend more on their car than it's worth because the sentimental value of their car outweighs all other considerations... it's our place to make you aware of the options and alternatives, so that you can make informed decisions. See also: Law of Diminishing Returns, 80/20 Rule. Proteins that act as a catalyst for biochemical reactions. They are used in many of the cleaning products we use. We also apply them in a pure form, especially for odour control and accident clean-up. An estimated price based on the information available at the time, i.e. a photograph. See also: Quotation, Guesstimate, 1hr and Estimate. Some corrosive substances eat into your car's paintwork etching a mark. These marks can sometimes be removed with paintwork correction, but it is important to neutralize the corrosive substance as part of the process otherwise the etch marks may return. A paint primer which contains some corrosive chemicals which etches the substrate causing a extras strong key so that the primer doesn't come off. A special lacquer used for lacquering polished bare metal. Because when you lacquer metal the aim is to display the metal, no primer is used during the process... the result is that lacquer is notorious for peeling off bare metal. One answer is to use a lacquer which has an etch (See etch primer) to it to help the lacquer to key. The finish created at the point of manufacture. In some cases it is desirable to restore or replace in order to keep the original factory finish rather than use more drastic methods of repair. When re-painting a panel, it is best practice to 'fade out' or blend over a larger area or onto adjacent panels, this means that the area of repair is usually much larger than the origional damage. When Smart Repairing a small area, it's best practice to fade out to the edge of the panel, while in bodyshop repairs, it is best practice to fade out over adjacent panels, for example, if repainting a bonnet, the tops of both wings should be painted as well. There are an almost infinite number of factors that can effect paint colours (Spray guns, nozzles, temperature, humidity, even magnetic fields), it is impossible to reproduce an exact colour match of the factory finish -- although it must be said that the difference should be very, very slight. Any difference in colour or finish becomes more obvious with sharp demarkation lines, fading out over a larger area overcomes this problem. 'Fade-Out' is also the name of a special thin lacquer especially designed for fading out. Similar to a swage line, feature lines tend to be far more pronounced and serve as a decorative feature. 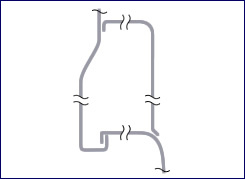 Feature lines can range from a deep fuller to a series of flutes, or an exaggeration on a air intake which makes it run the whole length of the car. Generally speaking, feature lines are on the side of the car. A body panel which serves no practical purpose and is solely a decorative feature. By they nature feature panels tend to be small and we may call them 'half panels'. Also called 'Solid-Base', it's a paint finish where a solid colour is applied over a primer with no clear lacquer. This form of painting has now largely been replaced by clear-over-base. See also: Clear-over-base, Clear Coat. A body shop term meaning to Wet Sand and then machine polish to remove imperfections in a painted surface. See also: Wet Sanding, Paintwork Correction, Buffing. A range of services aimed at restoring cars which have been contaminated with water. Not all cars caught in floods are economically viable. Careful research is required before taking on a car caught in a serious flood, however at the other end of the scale, cars that have ended up with a small amount of water in a foot well after being stuck in a ford, may suffer from damp smells, but are relatively straight forward. Article: Flooded cars are a potential time bomb! A 'ballpark figure' guess as to what something is likely to cost. It is sometimes necessary to make a guess at how much something is likely to cost just so a client can work out if a job is likely to be economically viable, or if its something they want to pay for them self or make an insurance claim. If it seems likely that a job would be economically viable we can then take the next step, investigate further and move closer to a definite costing. See also: Economic Viability, Estimate, Quotation, 1hr and Estimate. By our definition, a small body panel. We use this in regards to pricing as a 'half panel' will usually require repair along with a full size panel, leading to a 'repair and a half'. 2. 'A key' is a rough surface deliberately produced to enable paint, primer or lacquer to stick to the surface it is being put on. Paints will peel off of smooth surfaces because they have nothing to grip to. So it is usual to used a very fine sand paper to "key" (rough up) the surface prior to painting or priming (Priming is rough and essentially does the same job). The alternative to this is to use a primer or lacquer with some etch in it. The key fairy is a small impish creature which steals and hides car keys and the adapters used for removing locking wheel nuts. A close relation to the pen fairy, the lighter fairy, and the nail-clipper fairy. The tendency for a continuing application of time, effort and/or skill toward a particular project or goal to decline in effectiveness after a certain level of result has been achieved. This is a problem which effects many areas of what we do, and so often we account for this with either fixing different levels of service or agreeing a cut-off point with the customer so that we ensure there is a Win-Win. One area where the law of diminishing returns is especially relevant is in machine polishing (buffing, paintwork correction) the paintwork of a car. An amazing improvement in the finish of a car can be achieved fairly easily and cheaply. However, to take a car to the nth degree required many hours or days and a high degree of skill. In a more general sense of the expression, spending £200 on repairs may increase the value of your car by £600, giving you are 300% return. Unfortunately, you can't keep on spending money and expect the same kind of return... if you could we would all be millionaires! See also: 80/20 Rule, Economic Viability. Usually refers to the date a leased car is returned to the lease company at the end of contract. The act of polishing paintwork by means of a machine, either a rotary polisher or random orbital polisher. We use machine polishing extensively as part of our Modern Car Renovation and Paintwork Correction Services to remove minor paintwork imperfections and to polish cars to a high sheen. A small to medium panel repair-and-repaint which is carried out by a body shop, and yet does not fall into the category of 'crash repair'. Generally these repairs do not require the replacement of body panels or bumpers, or need major panel beating. Essentially it is Smart Repair/Small Area Respray on a slightly larger scale. This kind of repair is convenient and because it doesn't require major parts and many hours of labour, it can be relatively quick. The cost is usually low enough that it falls in around most people's insurance excess meaning that they would choose not to make an insurance claim and so avoid phoning call centres, filling out forms, waiting for approval, increased premiums and renewal costs etc. 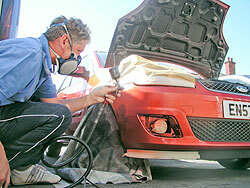 See also: Small Area Respray, Body Shop Repair, Panel Beating, Paintless Dent Repair, Smart Repair. The practice of restoring modern roadworthy cars to a 'nearly new' condition using mainly Smart Repair Techniques, Valeting, and minor body shop work. 'Modern Car Renovation' is another term coined by New Again (Circa 2008) as a label for one of the services we provide and as part of our efforts to define and group 'the five things we do'. We restore cars, but most people associate 'Car Restoration' with stripping down an rebuilding classic cars. Apart from the fact that this kind of rebuild is very different from what we do here, it serves a very different end as it is usually undertaken by enthusiasts and is seldom cost effective... classic car restorations often create a loss. While our aim is very different and we work on the assumption that a customer wishes not only to restore the appearance of their car, but also to maximize it's value. Thus we aim to give the customer a return on their investment. A slang term for Machine Polishing. Rapidly falling into disuse in the industry as if belittles the high degree of skill required to do the job to a high standard. Slang term for a rotary polisher or polishing pad. Now seldom used. May also be used to describe the Wool head attachment of a machine polisher. Some orange peel is perfectly normal and desirable for the reason described above, however a heavy orange peel effect is usually a sign of a poor repair. Some people use the expression 'orange peel' solely with this negative connotation. In years gone by, especially in America, it was fairly common for those customizing cars to spray many coats of paint onto a car until it was quite thick, and then flat-and-polish the car to give it a glass like finish, removing all trace of orange peel. There is still a demand for orange peel removal among car enthusiasts, however, we don't believe it is something that should be done to a factory finish. For anybody wishing a perfect finish we would recommend contacting a body shop about a full custom paint job. See also: Wet Sanding, Flat and Polish, Factory Finish. A foam polishing pad used as part of a machine polisher. A technique where dents are removed from a car's body panels by manipulating and massaging them out with metal levers. Methods used to correct imperfections in car paintwork, usually by means of Machine Polishing and Wet Sanding. Paintwork Correction can be used for removing or reducing swirl marks, washing marks, key scratches, and etching caused by bird droppings and other corrosive substances. Although all these services have been available for many years, mainly through body shops, there was no all encompassing term to describe them. In order for New Again (or Clean Image as it then was) to be able to market these services to the public as a stand-alone service, it was decided that they should be re branded and a name should be found. After a short staff meeting in 2003, the name 'Paintwork Correction' was decided upon after a suggestion by Danny. Since then the term has come into common usage within the industry. A body panel: One single metal or plastic panel on a car's bodywork i.e. a door, wing or bonnet. One panel is usually separate from another by a shut. A main panel may contain a smaller panel such as a rumble strips or feature panels these are sometimes called half panels. The art of repairing or making metal body panels carried out at a body shop. 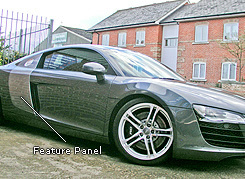 If it is possible to 'beat' a panel back into shape, this is usually preferable to buying a replacement panel. A body shop can use this method for dents which are just too large or sharp for paintless dent removal to deal with. After hammering our the dent, the panel is usually finished with a skim of filler and then repainted... although at the very pinnacle of the art whole new body panels can be fabricated from sheet metal, although this is usually only done on vintage cars where replacement panels are hard to come by. Panel beating may also describe other body shop methods, for example where areas of a panel are cut out and new metal welded in. Please note: None of this is really anything we get involved with directly here at New Again. See also: body shop, Midi Repair, Paintless Dent Removal, Smart Repair. This is a term we sometimes use when we piggyback one job onto another. It's not a wonderful name for the practice, but we are yet to come up with anything better -- we are open to suggestions! Essentially, for your benefit and ours, it is sometimes useful to book a repair to be done at a time when other repairs are already being done. Sometimes it's difficult to see from a photo if we can do a repair, in some cases the only way for us to find out is to try. In these cases, we ask that you are brining your car to us at a time when we are doing this kind of repair, in which case we will allot some extra time to do it rather than giving you your own appointment. The reason for this is quite simply because you may get here and we find we can't help you in which case one or more of our team would be left standing around with nothing to do... if that were to happen on a regular basis we would have to start charging for consultations. This would mean that you would have a wasted journey and get charged for it. 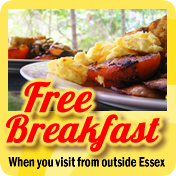 Instead we encourage you to visit us at a time when a technician is doing several similar repairs, even if he cannot do the repair he will be able to give you expert advice and offer you a 'plan-B', often this will mean that you can at least leave us with a quote, or perhaps go straight on to a bodyshop, trimmer, etc. A liquid or paste containing an fine abrasive substance for polishing. Strictly speaking, polishing is an act whereby a surface is smoothed to a high shine by means of friction. However, the word 'polish' is often applied by marketeers to products which are actually a wax. Sometimes this label is justified because the wax does contain abrasives. Here at new again we are careful to be specific and use the word 'polish' according to strict definition. A price you can quote us on. 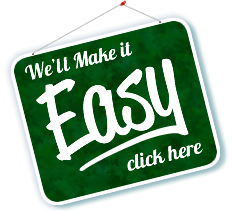 It is our policy that when giving quotes that we are as comprehensive and specific as possible. 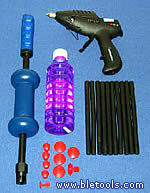 We try to give breakdown of items so you an see exactly what you are paying for. Where necessary we warn about possible additional costs so that you have no surprises. See also: Estimate, Guesstimate, 1hr and Estimate. By our definition, a S.M.A.R.T. repair which is required over a body panel plus a smaller panel such as a rumble strip or feature panel. An insert on a body panel or bumper, originally made of durable rubber or black plastic and designed to offer some protection against scuffing and denting, much the same as a skirting board or dado rail is was designed to protect the walls in your home. However, in most cases they are no longer durable or protective and tend to be a colour coded decorative feature. A structural element of a car's bodywork, usually consisting of a horizontal box section, or a decorative panel hiding a box section. In the motor industry, 'sill' is almost always used exclusively to refer to the section which runs along the length of the car underneath the doors, even though there may be other sill from an engineering definition. A form of S.M.A.R.T. Repair which involves repairing and repainting, without the need for panels to be removed or replaced, and which can be done without the need of bodyshop facilities. 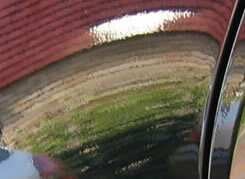 It's most ofen done on the corners of bumpers, so you may find us refering to it as a 'bumper scuff repair'. An acronym for 'Small/Medium Area Repair Technique. Smart repair is used to describe a wide range of repair techniques, however most people within the trade and the buying public tend to refer to these techniques by their specific names, i.e. Paintless Dent Removal, Cigarette Burn Repair, Bumper Scuff Repair, Small Area Respray, Scratch Repair, etc. See also: Midi Repair, body shop Repair. Article: Smart Repair And why we ask you to send us photos. A deliberate design element of car body panels in the form of a crease or angle. 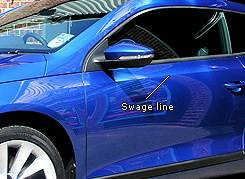 Swages lines are used to give shape to your car, but also add strength and help prevent vibration and noise. 1. Washing Marks -- Also known as spider marks or cobwebs. Caused by poor washing technique, car washes, or rubbing a dirty panel. These marks are caused by rubbing dirt against the car during cleaning or maintenance, or by coarse washing equipment such as brushes. 2. Buffer Marks -- Also known as Holograms or smudges. These are caused by the abrasive polishes, compounds, and pads used in machine polishing. To remove 'Washing Marks' it is necessary to used abrasives to wear down the surface of the paint. These abrasives themselves cause fine micro scratches, but by using progressively finer pads and polishes these should be removed by the end if finished properly... but it is much easier said than done. See also: Paintwork Correction, Modern Car Renovation. A branded polishing product. It's rather old fashioned and can be a little harsh for modern paintwork, but as it is a pure polish it still has it's uses and so is likely to be around for many years to come. The panel that extends from below the vehicle's front bumper towards the ground. Sometimes called the front sill. A plastic material used as imitation leather. 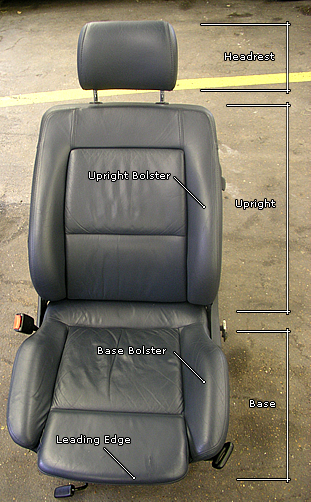 Commonly used for the backs and bases of seats even in cars that are advertised as having leather upholstery. A car wax contains synthetic and/or natural waxes and is applied as a protective coating. It also enhances shine by adding a glossy coating. A process where imperfections in the surface of the paintwork are removed by rubbing down with Wet & Dry paper (sand paper). This leaves the surface of the paintwork rough having been sanded, so it is then made good by machine polishing. See also: Flat and Polish, Machine Polishing, Buffing. Paintwork Correction. A mutually beneficial arrangement or transaction where both parties benefit equally. Everything we do has to pass the Win-Win test and result in a win for the customer and a win for us. A fair outcome for all concerned. We do one hour of work at a fixed hourly rate, and then give a Estimate as to how much it would cost to complete the job. With certain kinds of work it can be very difficult to give an accurate Quotation or estimate just by looking, i.e. Accident Clean-up or Flood Restoration. In such cases we have found that the fairest way to approach things is to first give a Guesstimate so that a client can calculate if a job is economically viable, if it is we follow this with a 1hr & Estimate. 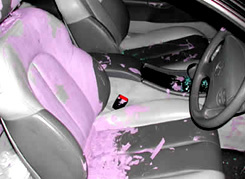 For example, if a car's interior was covered in paint we wouldn't know how easy or difficult it was to remove until we tried. So we would work on the car and see how much we could get accomplished within 1 hour. This would also allow us to get a better gauge as to which parts and fittings could be salvaged and which would need replacement and explore the full extent of any damage by lifting carpets and other fixtures. See also: Quotation, Estimate, Guesstimate. A rule of thumb concerning the law of diminishing returns that states that the first 20% of effort gives you 80% of the result, while the remaining 20% requires 80% of the effort. In theory, the rule of thumb could have been 90/10 or 99/1 -- both are equally valid, however when we find ourselves in a situation where the law of diminishing return applies, it's at 80/20 where we need to start discussing with the customer where they want us to stop. Beyond this point the problem of economic viability can come into play. A useful example would be where we are being charged by the hour to clean up a paint spillage. Cleaning up the bulk of the paint requires our 'effort', expertise and specialist equipment but can actually be rather quick. However, picking off tiny specs of paint requires virtually no effort, no skill, no specialist equipment beyond a fingernail, but is extremely time consuming! As such jobs can be rather therapeutic, some people would choose to do the last part themselves.